Are bond funds and individual bonds the same asset class? Bond funds and ETFs do not mature and you don’t get capital back, unless you sell your holding. Fixed income is a form of a loan to an issuer, and the loan is paid back with interest on a known date. You’re never paid back in a fund or ETF. You have to sell your units to realise the value of your investment. This significantly changes the basic characteristics of the investment compared with bonds held individually. They deliver the low price volatility and predictability of returns that investors typically want from their fixed income investments. Investors lose this most fundamental of features when they hold bonds indirectly in perpetual funds and ETFs. While individual bonds inside funds and ETFs mature all the time, there are usually hundreds of different bonds in each fund at any one time. New ones are added all the time so you lose the predictability that individual bonds provide. If covering your living expenses relies on the returns you receive from your fixed income assets, then the predictability of your income and returns is very important. Term Deposits¹ and individual bonds provide that predictability. There are many funds and ETFs that cover bond markets and bond indices. The pool of funds in the managed fund segment in particular is significant in size. The core benefit of both ETFs and managed funds is that they give investors very well diversified exposure to bonds. Diversification is important both across asset classes, and within asset classes. XTBs have some similarities in structure to ETFs and managed funds, because they’re all based on unit trusts. However, beyond legal structure the similarities fall away. The single bond approach of XTBs is very different to an index-tracking ETF, or a diversified managed fund. The loss of predictability that funds and ETFs experience has practical consequences for many investors, and particularly retirees. In the institutional world, large superfunds need to pay retirees their super at known dates in the future. If the fund is a defined benefit fund, then the amounts they need to pay retirees are also known, which the fund needs to plan for. These sorts of superfunds invest heavily in bonds because they can match the known outcomes from individual bonds with the known payments they need to make to retirees. On a different scale, this is the same for many investors and retirees. You need a style of investing that matches the profile of your known outgoings. The professionals call it ‘liability defined investing’, which is just another way of saying ‘outcome based investing’. If you have known outgoings you need known outcomes from your investments. This allows you to sleep well knowing you’ll meet your future obligations. Are individual corporate bonds better than ETFs? When you buy a range of individual bonds or XTBs, you know precisely what the outcome will be on the day you invested provided you hold to maturity. This allows you to accurately predict and plan the cash flows from your investment. This is an advantage for investors with regular expenses or retirement costs. You cannot do this with any diversified fund or ETF because the portfolio changes all the time and there is no principal repayment on known dates, because they never mature. Diversification is very important, but when you choose a fund or ETF as the means to diversify, it has this unavoidable drawback. Interest rates have been falling for some years now, so fund and ETF returns have been good (fixed rate bond rise in value when rates fall). What happens when rates rise again, and what rate-risk is built into the index? Most ETFs and some managed funds track, or are benchmarked against broad bond market indices that are dominated by government bonds. The Bloomberg Ausbond Composite Index usually has in the region of 85% government bonds. This is the risk for all fixed-rate bonds, funds and ETFs over them that rates will rise and the value of the bonds will fall. If you hold bonds individually, when rates rise and your bonds drop in price, you can hold them to maturity and they’ll mature at par value anyway. That’s not much comfort if you’re holding a 30 year government bond, but XTBs cover corporate bonds with an average term between 3 and 4 years. As bond funds and ETFs don’t mature you don’t have the option of holding to maturity. Since the GFC, governments and other bond issuers have been issuing longer and longer dated bonds each year and so the average term of the index has been increasing month-on-month for 8 years. The prices of longer-dated fixed-rate bonds are more sensitive to rising rates than shorter dated bonds. The average term of the index has been increasing for 8 years. The interest rate risk of the index and all funds and ETFs associated with it has also been increasing for 8 years. Interest rate risk is also called ‘duration risk’, it increases as bond terms get longer. If the index ‘duration’ keeps increasing each year, then the price fall – when rates rise – will be even greater. A 1 year bond might have a duration of 0.8. This means its price should fall approximately 0.8% for a 1% rise in yields driven by a rate rise. A 30 year bond might have a duration of 20. This means its price should fall approximately 20% for a 1% rise in yields driven by a rate rise. As a general note of caution – make sure you know what you’re doing with long-dated bonds. They can deliver great outcomes over the long-term, provided you’re aware of duration risk. The fact you cannot just hold a fund or ETF to maturity. Many commentators are suggesting that the world is moving into a high fiscal stimulus phase. This will likely fuel inflation, leading to rate rises. What’s the index made up of? The low yields on government bonds in an index drag down the returns available for funds benchmarked against, or ETFs tracking it. As Australian broad market indices are all dominated by government bonds, this impact is significant. Government bond yields are lower than TD rates. So most individual investors prefer TDs over government bonds, even though government bonds are now available on ASX. Corporate bonds from ASX 100 companies generally have higher yields than both TDs and government bonds. However the Composite Index only has about 15% corporate bonds. If your investment goal is to have a fixed income, defensive portfolio, with returns greater than TDs, then you may not achieve that by tracking the broad based bond indices. Corporate bonds are the next asset up the risk-return spectrum. Corporate bonds deliver a higher return than TDs, but without the risk of equities and hybrids. Investing in XTBs can provide considerably better yield. This is achieved by giving you access to the higher yielding corporate bonds from the index, without the drag government bonds will have on your yield. There are managed funds focused solely on corporate bonds and now some ETFs tracking corporate bond specific indices. However be aware of the features of funds and ETFs we’ve discussed here. With XTBs, you are invested in a security that covers an individual bond such as a Woolworths or Telstra bond. 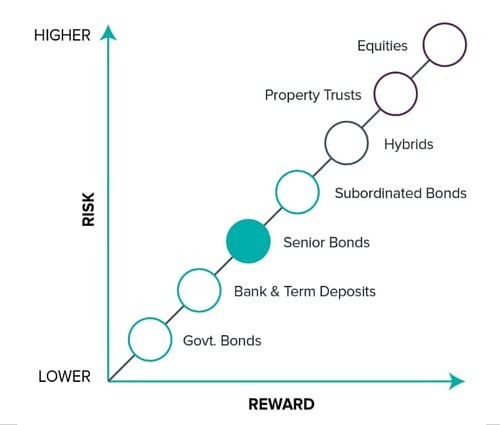 The returns on the XTB and its price movements are all linked to the individual bond. Finally, take care to look out for the manager’s fees. All investment products, including XTBs, will have a fee. However some managers quote their returns before fees, which can overstate what you’ll actually receive.